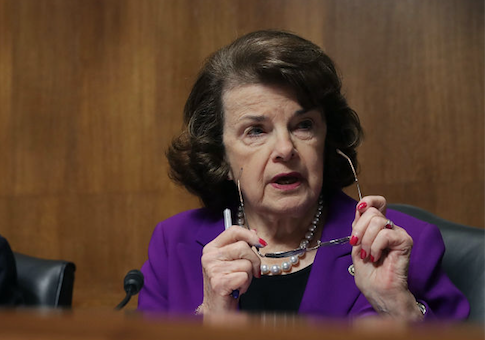 Sen. Dianne Feinstein (D., Calif.) said Tuesday that she cannot say whether the sexual assault allegations made by Christine Blasey Ford against Supreme Court nominee Brett Kavanaugh are entirely truthful. Feinstein told reporters that Ford, a clinical psychology professor at Palo Alto University in California, "is a woman that has been, I think, profoundly impacted, on this … I can't say that everything is truthful," according to Fox News senior producer Chad Pergram. Pergram tweeted Feinstein's comments, citing his colleague Connor Marley. Ford wrote a letter to Feinstein back in July describing her allegations. She accused Kavanaugh of pushing her into a bedroom, groping her, and attempting to undress her while they were high school students at a house party in Maryland. Kavanaugh has completely denied the allegations, as has Mark Judge, a friend of his who Ford said witnessed the assault. "I have no memory of this alleged incident," Judge said in a statement to the Senate Judiciary Committee. "Brett Kavanaugh and I were friends in high school but I do not recall the party described in Dr. Ford's letter. More to the point, I never saw Brett act in the manner Dr. Ford describes." Ford requested to remain anonymous when she sent the letter, and Feinstein did nothing with the accusations. The senator claims she withheld the information, even during her private meetings with Kavanaugh, out of respect for Ford. After details of the story leaked out last week, however, Ford decided to publicize her accusations. Feinstein has received criticism for not acting on the allegations until Kavanaugh's confirmation hearings concluded and the Senate is preparing to vote on his nomination. "It is an accusation which the ranking member of the committee has known about for at least six weeks," Senate Majority Leader Mitch McConnell (R., Ky.) said Monday. "Known about for six weeks, yet chose to keep secret until the 11th hour. Neither she nor any of her Democratic colleagues chose to raise this allegation during the committee staff's bipartisan background calls with the nominee." Several senators have called for both Kavanaugh and Ford to testify under oath before the Senate Judiciary Committee. Sen Chuck Grassley (R., Iowa), the committee's chairman, has scheduled a public hearing for those testimonies on Monday, but it is unclear whether Ford will testify. Sen. Susan Collins (R., Maine), one of the key swing votes in the confirmation process, said Monday that she needs to hear from both parties in order to make her own judgement. "In order for me to assess the credibility of these allegations, I want to have both individuals come before the Senate Judiciary Committee and testify under oath," she told reporters. "To be fair to both, we need to know what happened." This entry was posted in Politics and tagged Brett Kavanaugh, Dianne Feinstein, Sexual Harassment, Supreme Court. Bookmark the permalink.